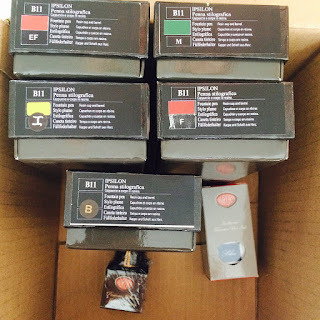 Aurora's Ipsilon Fountain Pens | Inkdependence! Have you used Aurora pens? It was a brand that I would see at pen shows, but not many other places. Lisa Anderson had said that she loves them, but I hadn't really gotten my hands on any until I got this amazing care package of pens from Kenro. 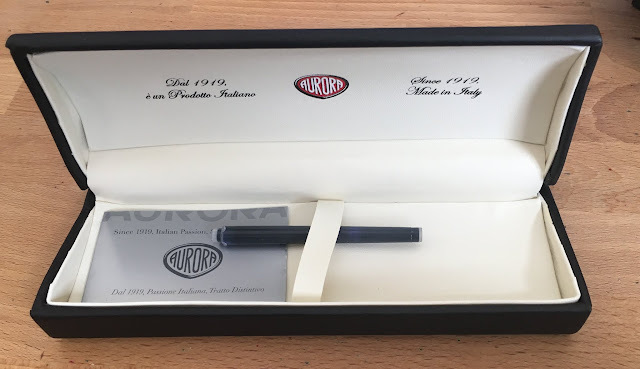 Aurora is a 4th generation family company that has been making pens in Italy since 1919. Every part of the pen is made in that factory. 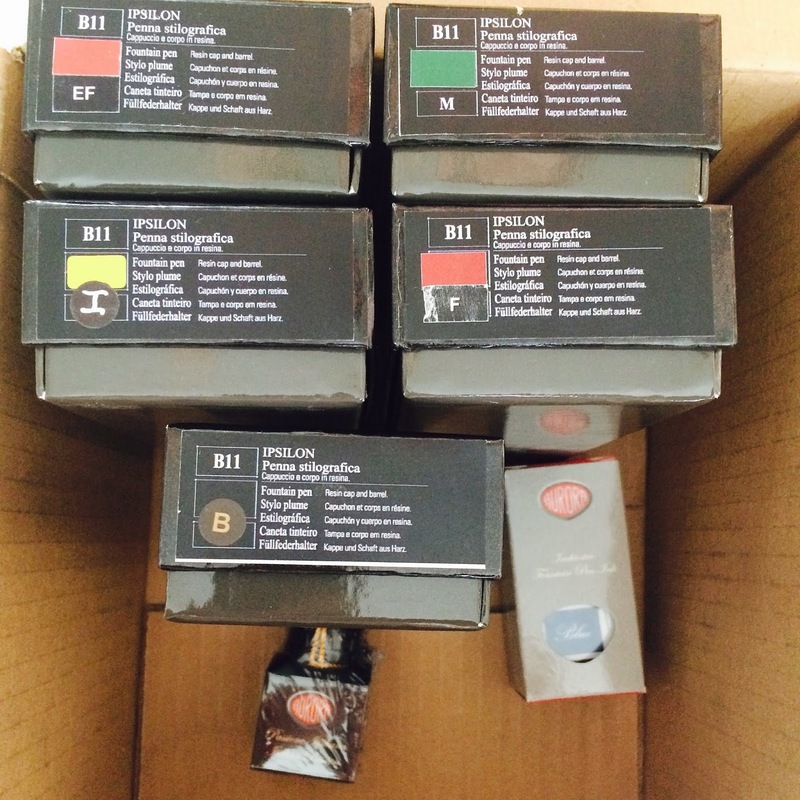 Nibs, feeds, everything. That includes cartridges. That's pretty impressive to me. According to Ryan at Kenro, the Ipsilon line is the best selling collection, and it comes in a ton of styles. These acrylic pens are the base model, and you can get them with gold nibs and sterling silver, if you like. I particularly like the Satin finish, I think. When I get myself one of these it'll probably be satin. Maybe orange? Yeah. Probably. All of the parts are interchangeable, so get a few and make yourself a rad Franken-Pen. I've just gotten a caliper, so I'll add that the width of the section is about 9mm. That's about a millimeter smaller than I really prefer, but it's certainly wide enough to use comfortably. I'm not generally a fan of packaging, but the Ipsilon's packaging is solid. The box is functional and good-looking. 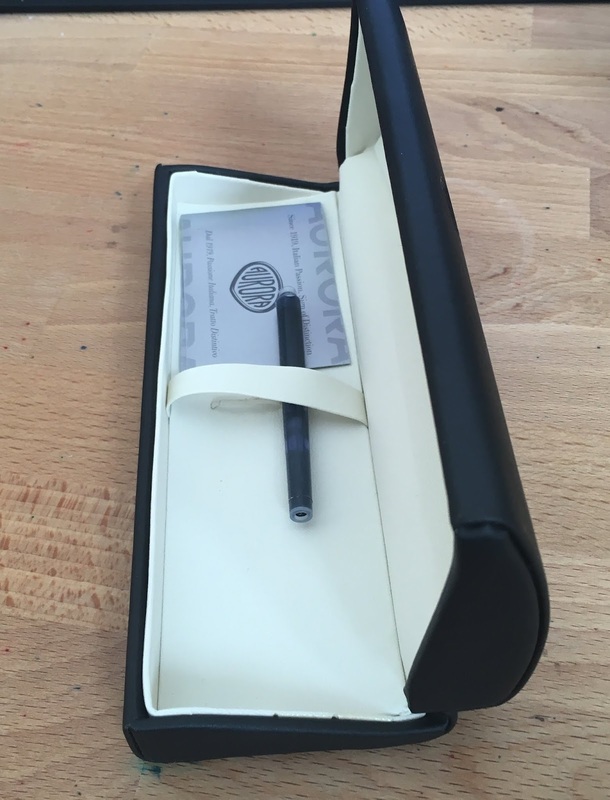 The side folds down a bit to make it easier to remove the pen case, and that's a good touch. I do wonder how much that box adds to the price of a pen, though, and whether people would rather just save a few dollars on each pen than have a box. 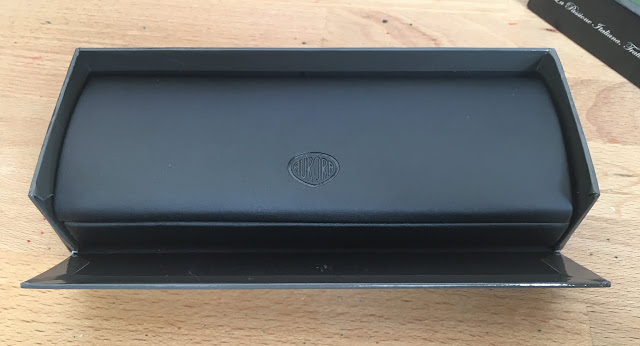 The leather box that houses the pen, though, is seriously good. You can't hide a cartridge under the platform, but this whole box smells like new-car-leather smell. Italians know leather. Each of these pens came with a cartridge and a converter. It's a big cartridge. Similar to a Lamy or an Int'l long size cartridge, I think. Unfortunately, Aurora uses a proprietary sizing, and int'l cartridges/converters won't work. I have read online that the Cross carts and converters will fit these pens, but I haven't tried that myself. It's a classy look, folks. The gold plated furniture isn't usually my style, but I dig it on this pen. I don't know why, but I do. Maybe it's something about the resin colors or the symmetry of the pen, but whatever it is it works. This black version really shows off the style of the Ipsilon. The cap is thick, the end of the barrel is slightly tapered. The clip is bold without being outlandish. That band in the middle is a great accent. The band around the middle reads "AURORA" and "ITALY." That's about the only branding on this pen. What's your favorite color? I think it's the red, for me. You can get these pens in many different styles. These are resin with a brass inner sleeve. I assume that the other styles have that same brass sleeve to add some weight. The resin on these pens feels expensive. It's thick and opaque. It feels durable. The edges are smooth and well-crafted. Just an excellent fit and finish. The nibs on these pens are made in-house by Aurora, and they're mostly very good. I loved the fine and extra fine nibs; the medium was very good. The broad and the italic had a bit of an issue when I originally got them, and even the replacements aren't perfect. The broad is a little toothy, but it works just fine. The italic is about a 1.2mm, and the tines seem a little convex. It works okay, and it's a true, sharp italic, but it can be a little hard for me to write with. It's a little odd that these weren't quite as good as the smaller nibs, but I suppose the line had to fall a bit short somewhere. You can see that the tips of the broad nib are a little wonky. It made writing a little toothy, but not bad. I included two shots of the italic nib. The shot above shows just how chiseled this italic nib really is, and the below shows the convexity I was talking about earlier. I think it would work better if it were actually flat, but that doesn't seem to be the way that these are made. The Ipsilon is a smallish pen, but it doesn't feel small or cheap. It feels solid and expensive, unlike some other pens that I could name. These are pens that I like much more than I thought I would. The parts are well crafted, the shape is great, and they're just the right weight and balance. There were a couple of nib issues, but nothing too terrible, and they were mainly sorted out quickly. 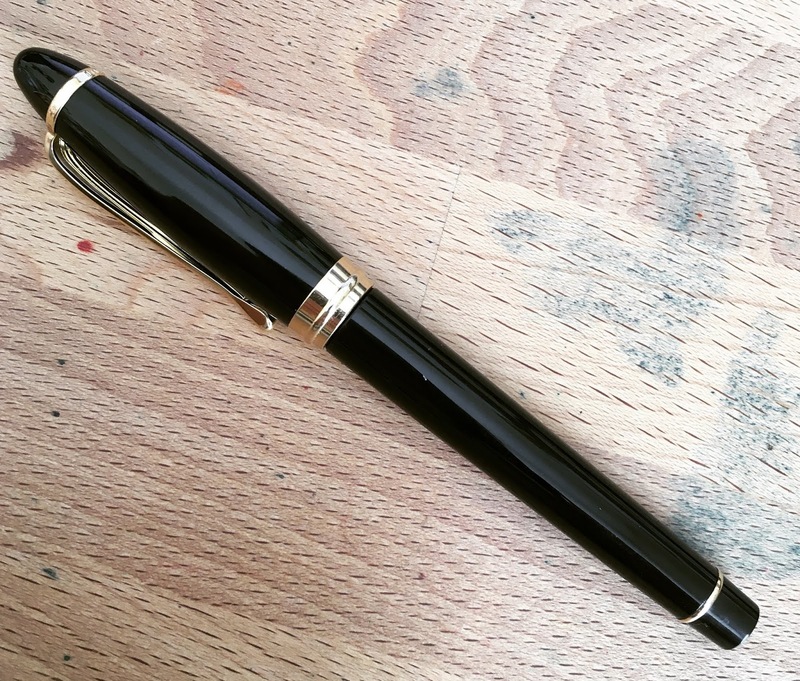 I generally try to advise buying a pen that I haven't, myself, bought. This time I will. It's a great pen, and I see one in my future for sure. You can find these at several retailers including Anderson Pens and Pen Chalet. There are 5 pens to talk about, so this video is extra long. Like, more than 20 minutes long.